Did a species of dinosaurs actually survive an extinction event 65 million years ago, did humans exist with them, and did they possess nuclear warfare millions of years ago? Has Earth always been dominated by intelligent dinosaurs known to ancient civilizations as Serpent Gods? Discover how ancient texts describe nuclear wars, serpent gods and how they mated with human women. Did they genetically create Homo sapiens and other Earth species? Lewis offers compelling evidence the dinosaur didn’t vanish, but evolved into what millions of abductees identify as Gray and Reptilian aliens. Witnesses and abductees tell of hybrids in underground bases, humans used for experimentation, and grays and reptilians who work with our military and governments in secret. Could abductions by these gray/reptilian beings account for thousands who have vanished without a trace? If so, this could be the greatest secret of all time, the one that has been kept from humanity for eons: Serpent Gods are terrestrial, not extraterrestrial and have controlled us for eons. This controversial book will challenge your beliefs on religion, evolution, aliens and UFOs and their agenda for humanity. 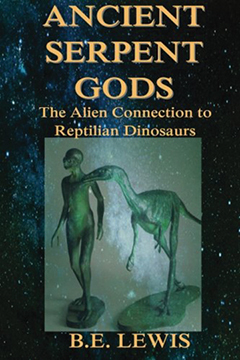 ANCIENT SERPENT GODS: The Alien Connection to Reptilian Dinosaurs By B. E. Lewis. 270 Pages. 6x9 Paperback. Illustrated.